Enquire or book a trip along Chợ Mới - Cần Thơ - Bến Tre - Cái Bè. Boarding at the Cho Moi ferry pier, welcome drink, introduction to the ship and crew, check into your cabin. Departure on Vam Nao river, then downstream on the Bassac river, as the crew serves lunch. Rest on the deck before the night. The Bassac drops anchor for the night. Boarding at Can Tho at Ninh Kieu pier. Welcome drink, departure downstream of the Hau river. Lunch on board while en route. 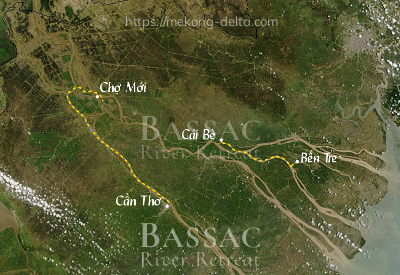 Branching into Mang Thit river towards Co Chien river.Rest on the upper deck or enjoy the open bar in a scenery of rice fields, sugar cane, woods on the near banks. Boarding back, complimentary drink as a welcome back on board. Open bar and rest on the deck enjoying the sunset. The crew will serve dinner while the Bassac is cruising through Co Chien then Cho Lach towards her anchorage point for the night. The Bassac sets anchor for the night on river My Tho. Breakfast is available at 6h30 AM. The Bassac cruises towards My Tho. Quiet lunch between My Tho and the Ben Tre islands. Boarding back before dusk, welcome drink, then departure towards Cai Be. The bar is open, and the upper deck welcomes you for a cool evening. If you are staying near Cái Bè, you may have a good time at The Island Lodge, at Michel and Françoise's on Thới Sơn island, facing the Mekong. The Island Lodge offers a relaxing experience by the pool, a view over the lush and ever-varied green of the countryside, and gourmet dining at Le Comptoir de Marthe et Édouard. There are opportunities for activities from The Island Lodge.